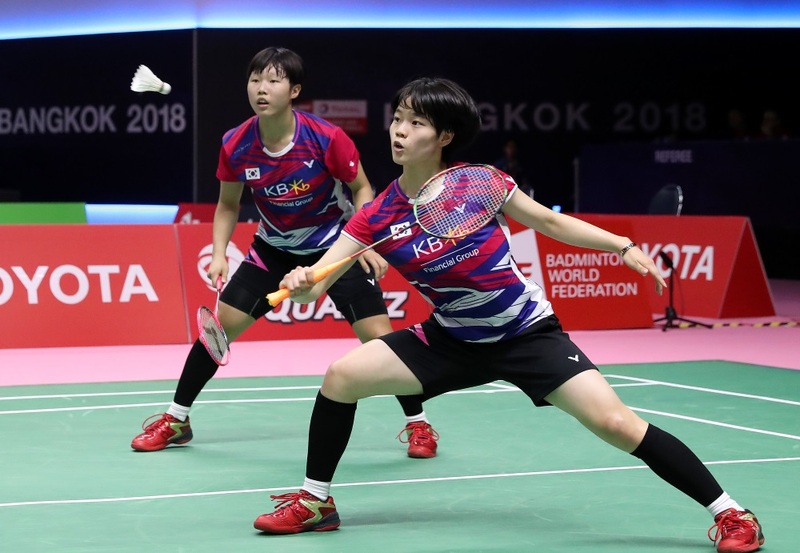 Korean schoolgirl An Se Young saved her team the blushes with a victory in the deciding fifth match of their Group C tie against Denmark, at the TOTAL BWF Thomas & Uber Cup Finals 2018 today. The 16-year-old (featured image), coming in with Korea tied 2-2 with Denmark, shrugged off her nerves and saw her team through with a 21-16 21-12 result over Line Christophersen, ensuring that her team finished on top of the group with three wins. Denmark made a fist of it despite missing their top pair Christinna Pedersen and Kamilla Rytter Juhl. For the Koreans, the absence of Lee So Hee to a back injury meant that the first doubles had to be rejigged. With Sung Ji Hyun getting the Koreans off to a good start, beating Mia Blichfeldt 21-13 21-12, there was little hint of the drama to come. Shin Seung Chan partnered Kim So Yeong for the first doubles against Maiken Fruergaard/Sara Thygesen. This time the Danes dominated the early phase, staying clear by a few points and taking the game 21-17. The second was much closer, with the Koreans having a narrow lead at 16-14, but Fruergaard and Thygesen shot past with four straight points and took the match 21-17 21-19. Line Kjaersfeldt helped Denmark get 2-1 ahead beating Lee Jang Mi 21-18 21-18 to put Korea on the ropes. Korea’s young talent shone through at this stage, with Baek Ha Na/Lee Yu Rim keeping their composure against Julie Finne-Ipsen/Rikke Soby 21-14 21-13, before An Se Young completed the rescue act in the fifth match. The other exciting contest in the second session was the Thomas Cup Group C tie between Hong Kong and Chinese Taipei. Hong Kong had to win the tie to stay in the competition, and Ng Ka Long gave them the start they needed beating Chou Tien Chen in the opening singles, 21-15 25-23. However, Chinese Taipei’s strength in doubles stood them well. Lee Jhe-Huei/Lee Yang dominated Or Chin Chung/Lee Chun Hei from start to finish, 21-14 21-17, before Wang Tzu Wei clinched the second singles overcoming Lee Cheuk Yiu 21-13 21-15. That set the stage for an exciting second doubles between Lu Ching Yao/Yang Po Han and Tang Chun Man/Mak Hee Chun. The contest wound to an exciting climax before Lu and Yang converted their chances at the end for a 21-19 17-21 21-18 result. In other ties during the session, Malaysia beat Algeria 5-0 in Thomas Cup Group D, while in Uber Cup Group C, Russia also blanked Mauritius 5-0.